Discoloured, matted-down, and dirty carpets make your car look old, and while there isn't much you can do for worn out carpets, you can make faded, and dirty black carpets look almost as good as new with Renovo Carpet Reviver. Cleaning, and reviving the colour of black carpets can do a lot to improve the overall look of your car's interior, and Renovo's new, unique and marvellous formulation not only cleans and re-colours black carpet, it also protects with an advanced anti-bacterial guard, is effective against super-bugs, and contains a UV inhibitor too. 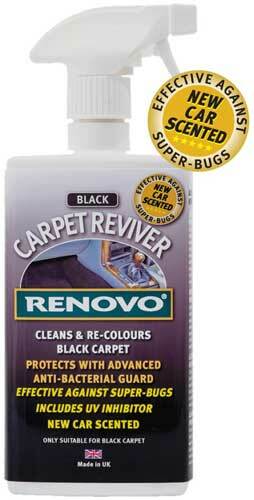 Renovo Carpet Reviver is simple to apply, gives unbelievable results and infuses your car with that 'new car' scent!